Sam Bryant returns to the Fire line-up for the 2017/18 season. We are delighted to be able to announce that Sam will be back in Fire colours for another season. The talented teenager had a fantastic first season with the Fire and his progress was clear to see through the year. Sam started his hockey career in Cardiff playing in the Cardiff junior system. In 2014 (as a 16 year old) he made the step up to senior hockey, combining NIHL 2 with U18’s. The following season Sam stepped up again to play NIHL 1 whilst captaining the Cardiff under 20’s team. 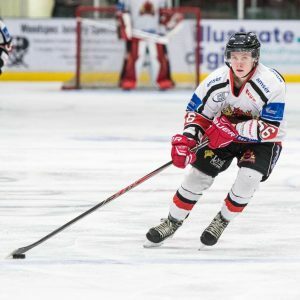 During the 2016/17 season Sam made the move to the Cardiff Fire, this was to be he best year in senior hockey scoring over a point a game and playing a tough physical style with 44 pims in just 14 league games. Sam also made his Elite League debut last season playing in a game for Manchester Storm, Sam made such a good impression he was called up a further time for the Storm. Mark Cuddihy added “Sam is a big player for us, he has good speed, is great in the corners and he plays a good two-way game. He’s still very young but he proved last season he can play in all situations. He’s tough and he proved that on many occasions dropping the gloves with much older/bigger players than himself. He plays with an edge and with his heart on his sleeve.